The United States has called on Pakistan to take “concrete” and “sustained” action to “reign in the terrorist groups” in order to prevent another escalation in the region, the Hindustan Times reported. “We need to see Pakistan taking concrete and sustained action to reign in the terrorist groups, mainly the Jaish-e Mohammed and the Lashkar-e-Taiba in order to ensure that we don’t have re-escalation in the region. And, if there’s any additional terrorist attack without Pakistan having made a sustained, sincere effort against these groups, it would be extremely problematic for Pakistan and it would cause re-escalation of tensions, which is dangerous for both countries”, an unnamed senior administration official told reporters at the White House on Wednesday. Asked about the measures undertaken by Islamabad in the aftermath of India’s air raid on an alleged Jaish-e Mohammad training camp at Balakot, the official reportedly said that it was too early to make a “full assessment”. The official, who spoke on condition of anonymity, said that Pakistan had taken some “initial” steps, but Washington “clearly” needed to see more. “We need to see irreversible action because in the past, what we’ve seen is they made some arrests and then a few months later, they released these individuals. The terrorist leaders are sometimes still allowed to travel around the country, hold rallies”. “So, we realise that if there, God forbid, would be another terrorist attack that you could quickly see the escalation in the situation once again. So that’s why, we’re making clear that any additional military action by either side runs an unacceptably high risk, for both countries and for the region. The terrorist attack on February 14th on India was a demonstration that Pakistan’s continuing provision of sanctuary for any terrorist group is not acceptable”, the official claimed. At the height of the crisis – 26-28 February – Washington was reportedly in continuous contact with both sides. “They were working the phones continuously and were deeply engaged in seeking to de-escalate what was a very dangerous moment in India-Pakistan relations”, the official added. The remarks come amid ongoing heavy cross-border fire exchanges between Indian and Pakistani forces on the Line of Control (LoC) in the disputed region of Jammu and Kashmir. Long-standing tensions between India and Pakistan were exacerbated by a suicide bomb attack claimed by Pakistan-based Jaish-e Mohammad on 14 February that killed some 40 Indian soldiers. New Delhi accused Islamabad of providing a safe haven for terrorists and retaliated by conducting an air raid on a suspected terror camp in Pakistan-administered Kashmir on 26 February that allegedly killed hundreds of terrorists and destroyed a number of facilities. Pakistan has disputed these claims, insisting that the warplanes didn’t target any terrorist infrastructure. On the next day following the strikes, Islamabad claimed it had downed two Indian warplanes over the LoC, and captured an Indian pilot, who was released a few days later. New Delhi confirmed the detention of the pilot and the loss of only one of its aircraft, having, in turn, come up with a counter-claim that the IAF had brought down a Pakistan Air Force F-16. In a bid to substantiate its arguments, the Indian military displayed fragments of an AMRAAM medium-range missile recovered in the Indian-administered part of Kashmir that is alleged to have been fired by the US-made fighter jet. 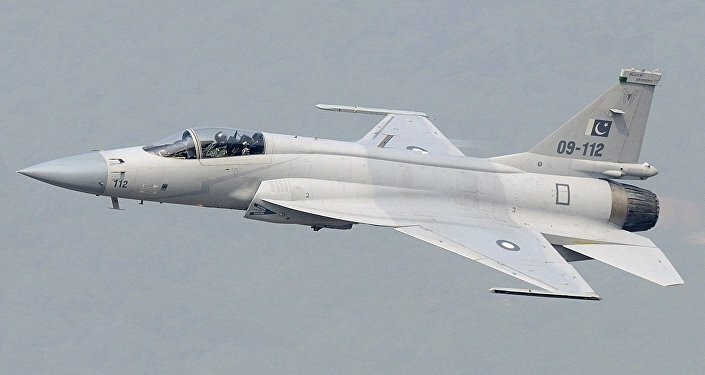 The Pakistani side has vehemently denied deploying any F-16s for dogfights or sustaining any losses, with Asif Durrani, former Pakistani ambassador to Iran and the UAE, telling Sputnik that the PAF had used JF-17 Thunder, made by Pakistan and China in joint collaboration.